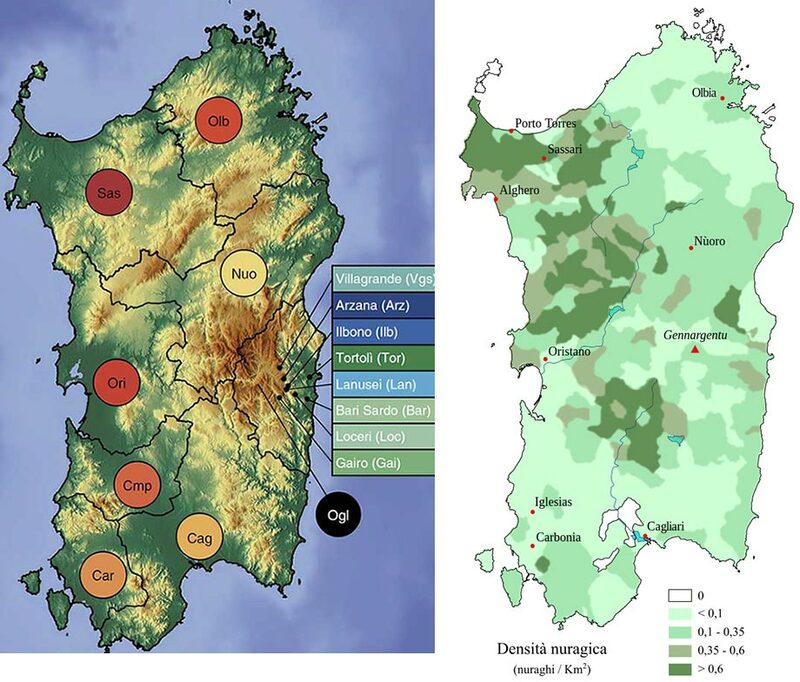 Open access Reconstructing the Deep Population History of Central and South America, by Posth et al. Cell (2018). The D4h3a mtDNA haplogroup has been hypothesized to be a marker for an early expansion into the Americas along the Pacific coast (Perego et al., 2009). However, its presence in two Lapa do Santo individuals and Anzick-1 (Rasmussen et al., 2014) makes this hypothesis unlikely. The patterns we observe on the Y chromosome also force us to revise our understanding of the origins of present-day variation. 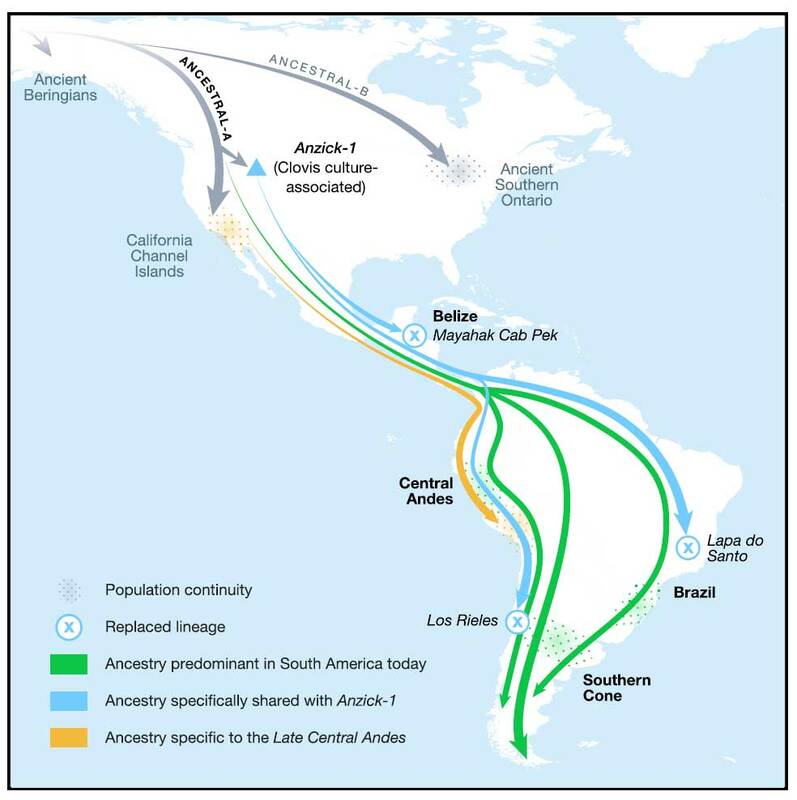 Our ancient DNA analysis shows that the Q1a2a1b-CTS1780 haplogroup, which is currently rare, was present in a third of the ancient South Americas. 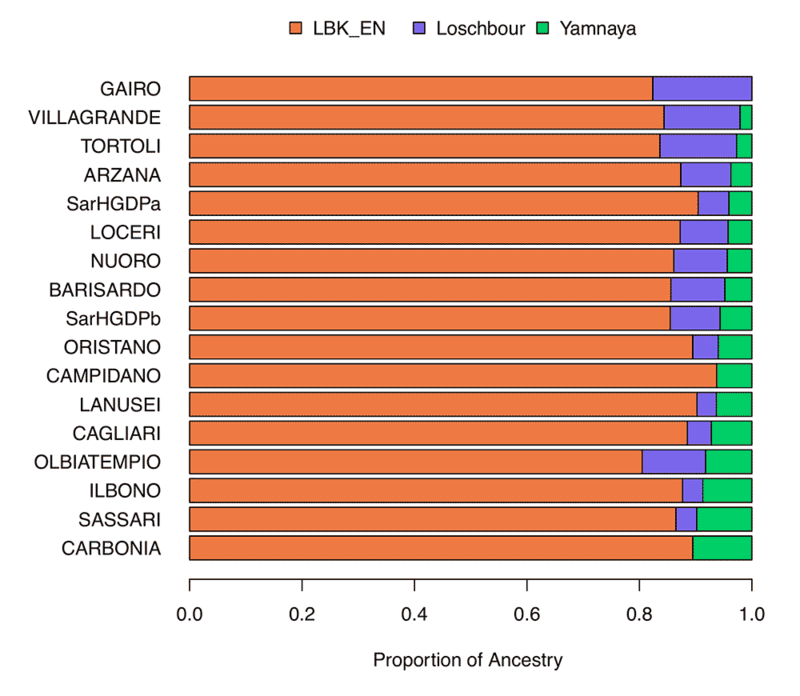 In addition, our observation of the currently extremely rare C2b haplogroup at Lapa do Santo disproves the suggestion that it was introduced after 6,000 BP (Roewer et al., 2013). 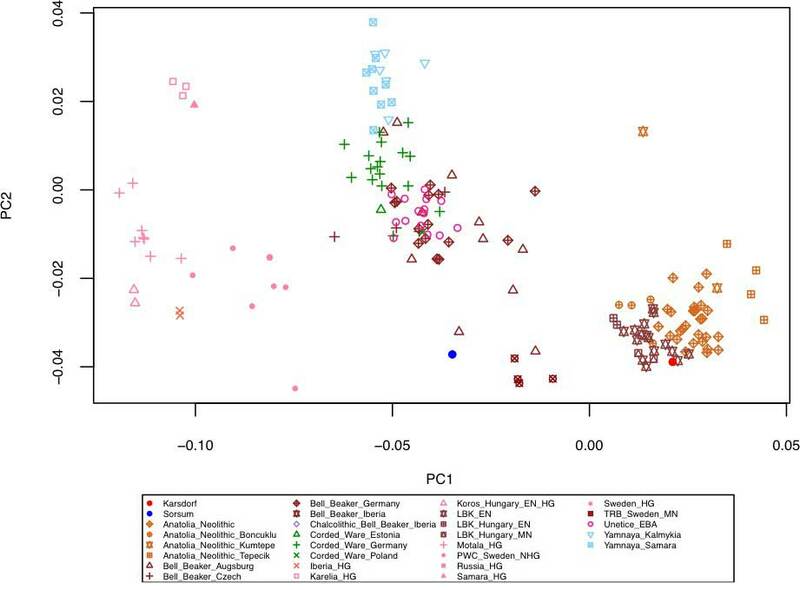 (…) Our discovery that the Clovis-associated Anzick-1 genome at ∼12,800 BP shares distinctive ancestry with the oldest Chilean, Brazilian, and Belizean individuals supports the hypothesis that an expansion of people who spread the Clovis culture in North America also affected Central and South America, as expected if the spread of the Fishtail Complex in Central and South America and the Clovis Complex in North America were part of the same phenomenon (direct confirmation would require ancient DNA from a Fishtail-context) (Pearson, 2017). However, the fact that the great majority of ancestry of later South Americans lacks specific affinity to Anzick-1 rules out the hypothesis of a homogeneous founding population. Thus, if Clovis-related expansions were responsible for the peopling of South America, it must have been a complex scenario involving arrival in the Americas of sub-structured lineages with and without specific Anzick-1 affinity, with the one with Anzick-1 affinity making a minimal long-term contribution. 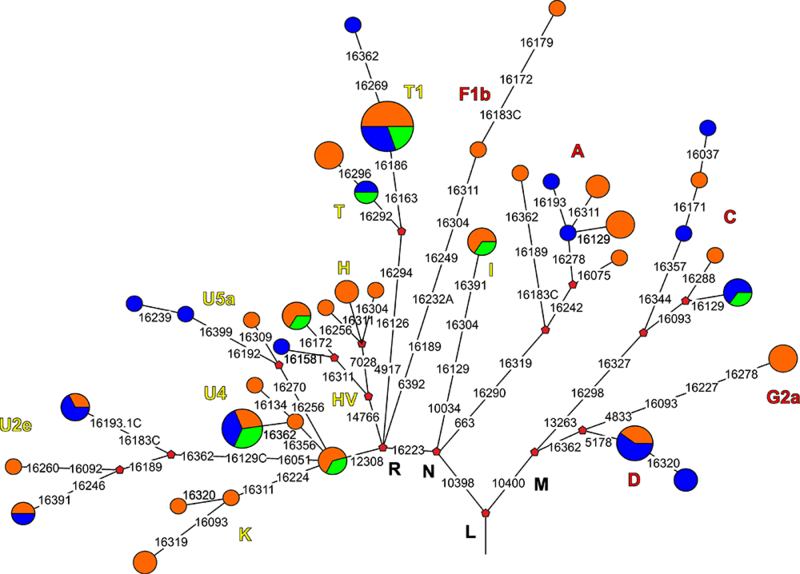 While we cannot at present determine when the non-Anzick-1 associated lineages first arrived in South America, we can place an upper bound on the date of the spread to South America of all the lineages represented in our sampled ancient genomes as all are ANC-A and thus must have diversified after the ANC-A/ANC-B split estimated to have occurred ∼17,500–14,600 BP (Moreno-Mayar et al., 2018a). 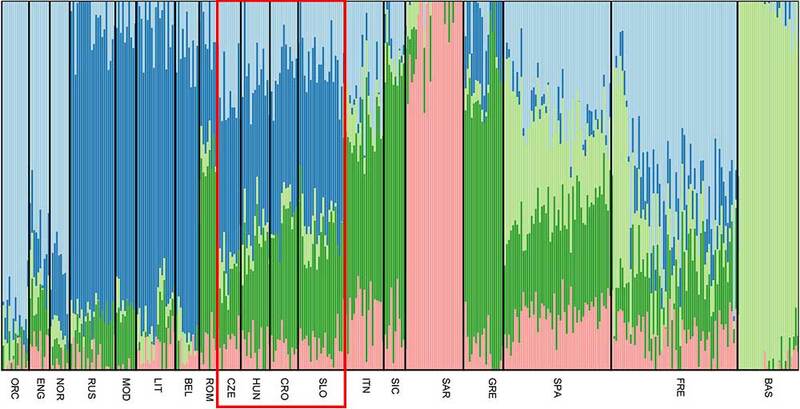 New paper (behind paywall) Early human dispersals within the Americas, by Moreno-Mayar et al. Science (2018). 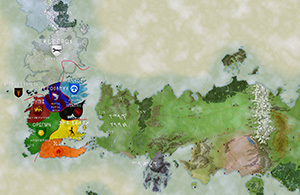 The Australasian signal is not present in USR1 or Spirit Cave, but only appears in Lagoa Santa. 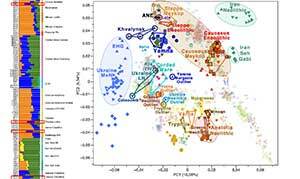 None of these individuals has UPopA/Mesoamerican-related admixture, which ap-parently dampened the Australasian signature in South American groups, such as the Karitiana. 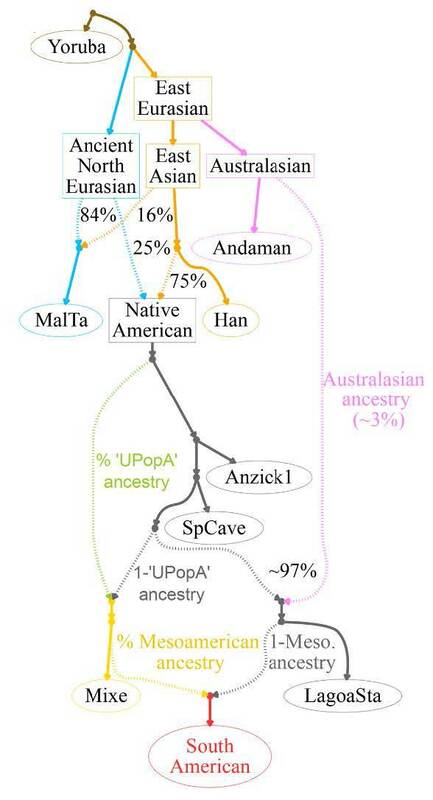 These findings suggest the Australasian signal, possibly present in a structured ancestral NA population, was absent in NA prior to the Spirit Cave/Lagoa Santa split. Groups carrying this signal were either already present in South America when the ancestors of Lagoa Santa reached the region, or Australasian-related groups arrived later but before 10.4 ka (the Lagoa Santa 14C age). 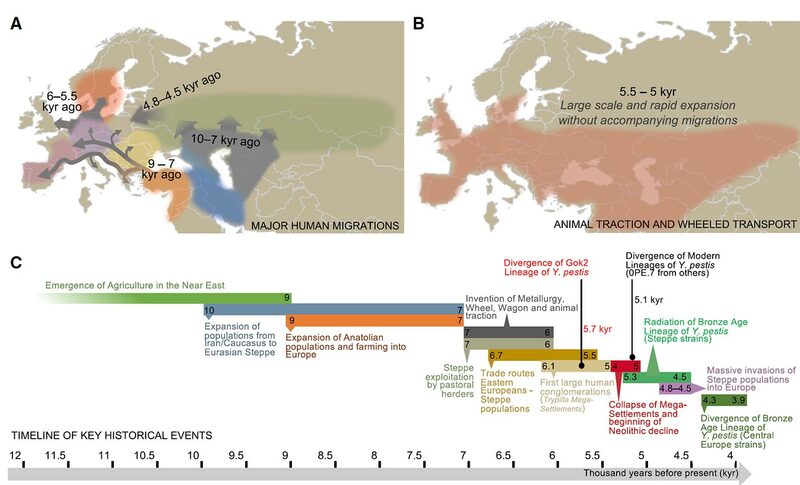 That this signal has not been previously documented in North America implies that an earlier group possessing it had disappeared, or a later-arriving group passed through North America without leaving any genetic trace. If such a signal is ultimately detected in North America it could help determine when groups bear-ing Australasian ancestry arrived, relative to the divergence of SNA groups. Although we detect the Australasian signal in one of the Lagoa Santa individuals identified as a “Paleoamerican,” it is absent in other “Paleoamericans” (2, 10), including Spirit Cave with its strong genetic affinities to Lagoa Santa. This indicates the “Paleoamerican” cranial form is not associated with the Australasian genetic signal, as previously suggested (6), or any other specific NA clade (2). The cause of this cranial form, if it is representative of broader population pat-terns, evidently did not result from separate ancestry, but likely multiple factors, including isolation and drift and non-stochastic mechanisms. 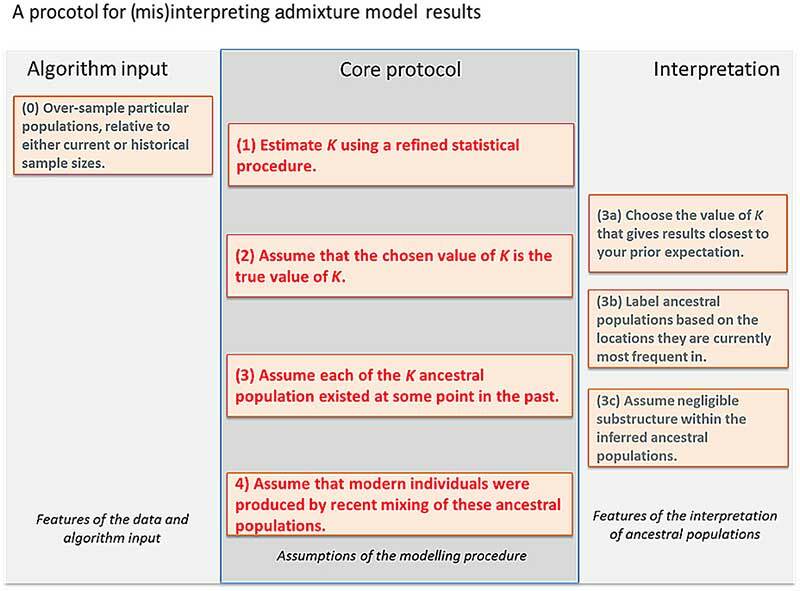 f-statistics–based tests show a rapid dispersal into South America, followed by Mesoamerican-related admixture. Schematic representation of a model for SNA formation. This model represents a reasonable fit to most present-day populations. Open access The genetic prehistory of the Andean highlands 7000 years BP though European contact, by Lindo et al. Science Advances (2018). The Alemanni were a confederation of Germanic tribes that inhabited the eastern Upper Rhine basin and surrounding region (Fig. 1) (1). 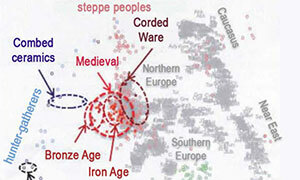 Roman ethnographers mentioned the Alemanni, but historical records from the 3rd to the 6th century CE contain no regular description of these tribes (2). 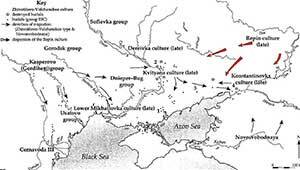 The upheaval that occurred during the European Migration Period (Völkerwanderung) partly explains the interchangeability of nomenclature with the contemporaneous Suebi people of the same region and periods of geographic discontinuity in the historical record (3). This diverse nomenclature reflects centuries of interactions between Romans and other Germanic groups such as the Franks, Burgundians, Thuringians, Saxons, and Bavarians. With the defeat of the Alemanni by Clovis I of the Franks in 497 CE, Alamannia became a subsumed Duchy of the Merovingian Kingdom. This event solidified the naming of the inhabitants of this region as Alemanni (3). From the 5th to the 8th century CE, integration between the Franks and the Alemanni was reflected by changed burial practices, with households (familia) buried in richly furnished graves (Adelsgrablege) (4). The splendor of these Adelsgräber served to demonstrate the kinship structure, wealth, and status of the familia and also the power of the Franks (Personenverbandstaaten, a system of power based on personal relations rather than fixed territory). Because inclusion in familia during the Merovingian period was not necessarily based on inheritance or provenance, debate continues on the symbolism of these burial rites (5). 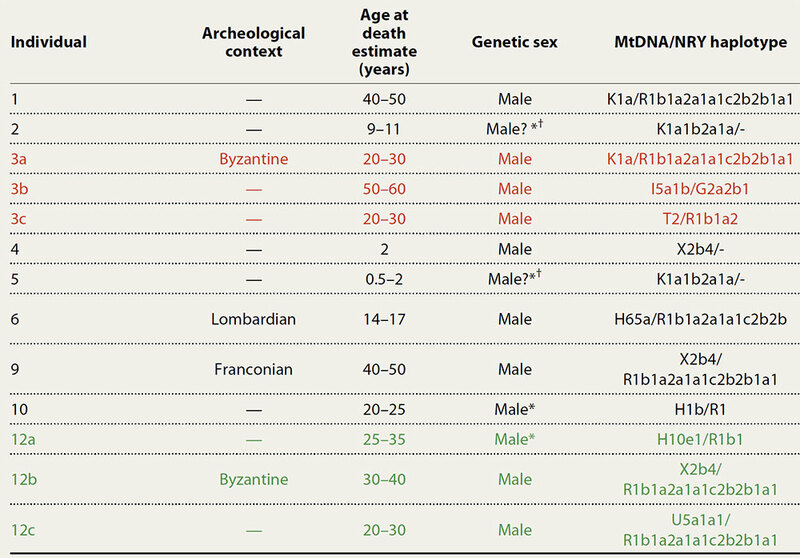 mtDNA haplogroups were successfully assigned to all 13 individuals (Table 1). 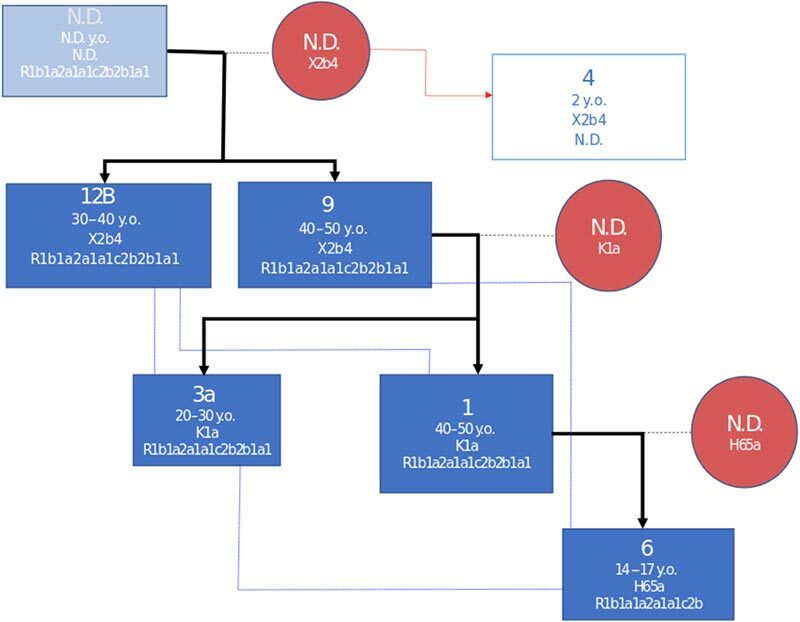 Notably, there are three groups of individuals that share, among the assigned positions, identical haplotypes: individuals 4, 9, and 12B in haplogroup X2b4; individuals 1 and 3A in haplogroup K1a; and individuals 2 and 5 in haplogroup K1a1b2a1a. 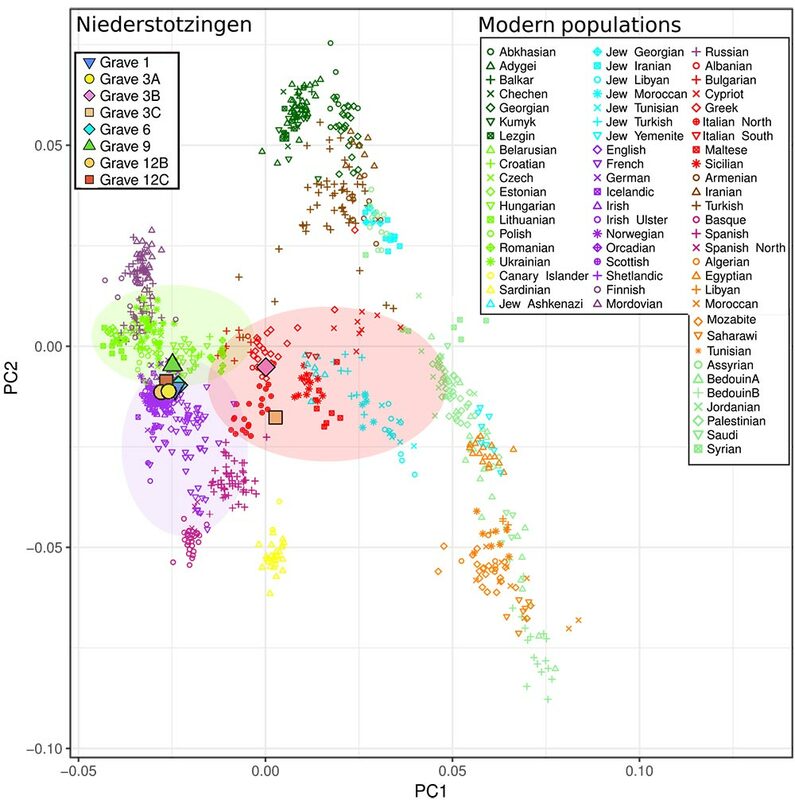 PCA plot of Niederstotzingen individuals, modern west Eurasians, and selected ancient Europeans. 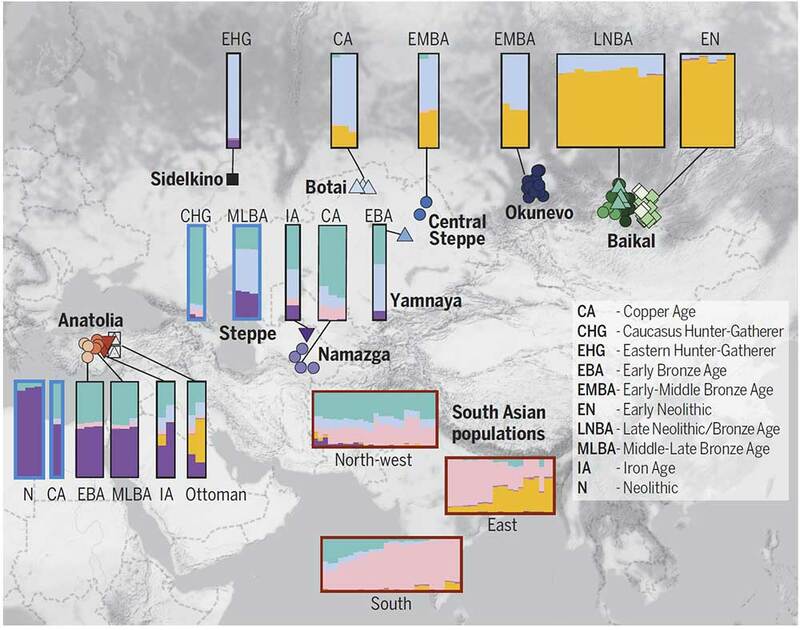 Genome-wide ancient data were projected against modern west Eurasian populations. Colors on PCA indicate more general Eurasian geographic boundaries than countries: dark green, Caucasus; bright green, eastern Europe; yellow, Sardinia and Canary Islands; bright blue, Jewish diaspora; bright purple, western and central Europe; red, southern Europe; dark brown, west Asia; light purple, Spain; dark purple, Russia; pale green, Middle East; orange, North Africa. 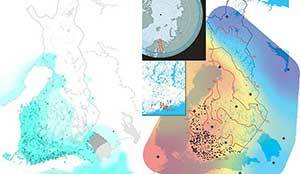 The transparent circles serve to highlight the genetic overlap between regions of interest. Genomically, the individuals buried at Niederstotzingen can be split into two groups: Niederstotzingen North (1, 3A, 6, 9, 12B, and 12C), who have genomic signals that most resemble modern northern and eastern European populations, and Niederstotzingen South (3B and 3C), who most resemble modern-day Mediterraneans, albeit with recent common ancestry to other Europeans. 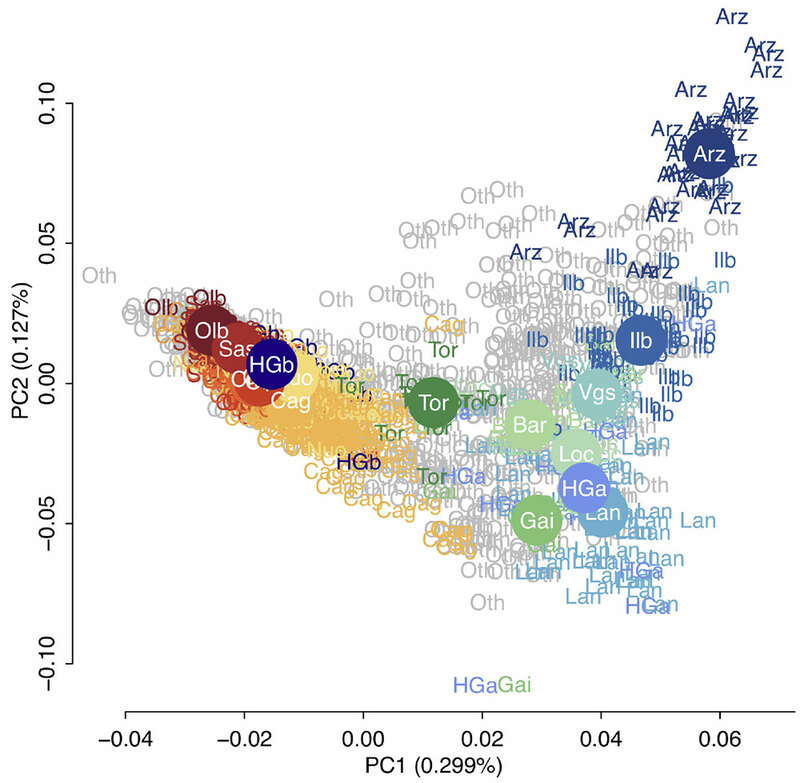 Niederstotzingen North is composed of those buried with identifiable artifacts: Lombards (individual 6), Franks (individual 9), and Byzantines (individuals 3A and 12B), all of whom have strontium and oxygen isotope signals that support local provenance (fig. S2) (8). Just two individuals, 3B (Niederstotzingen South) and 10 (no sufficient autosomal data, with R1 Y-haplogroup), have nonlocal strontium isotope signals. The δ18O values suggest that individuals 10 and 3B may have originated from a higher-altitude region, possibly the Swiss-German Alpine foothills (8). 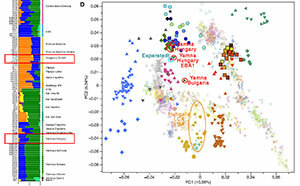 Combined with the genome affinity of individual 3B to southern Europeans, these data provide direct evidence for incoming mobility at the site and for contact that went beyond exchange of grave goods (4). 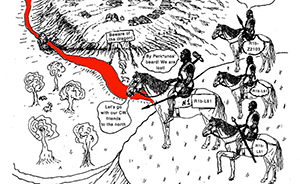 Familia had holdings across the Merovingian Kingdom and traveled long distances to maintain them; these holdings could have extended from northern Italy to the North Sea. Nobles displayed and accrued power by recruiting outside individuals into the household as part of their traveling retinue. Extravagant burial rites of these familia are symbolic evidence of the Frankish power systems based on people Personenverbandstaaten imposed from the 5th until the 8th century CE (4). The assignment of grave goods and the burial pattern do not follow any apparent pattern with respect to genetic origin or provenance, suggesting that relatedness and fellowship were held in equal regard at this burial. 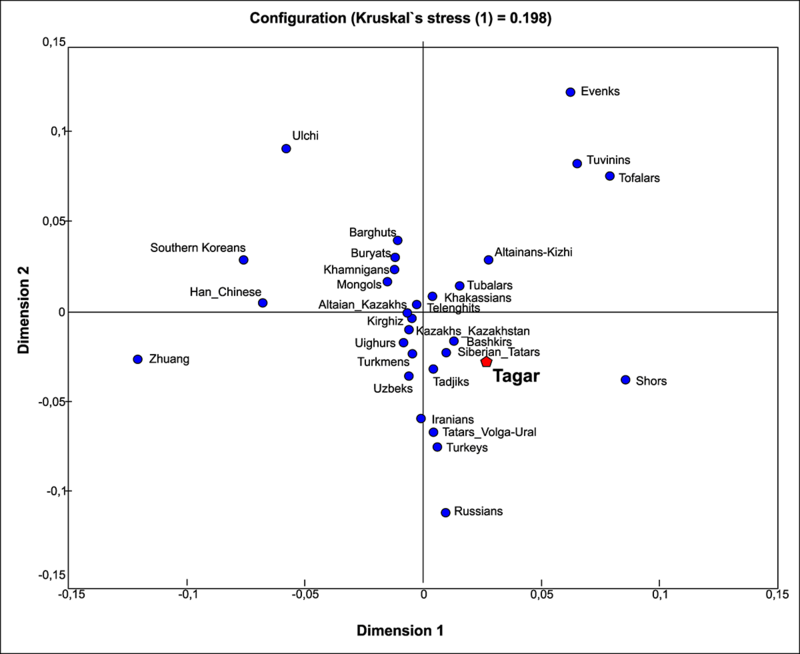 We demonstrated that five of the individuals (1, 3A, 6, 9, and 12B) were kin to at least second degree (Fig. 3 and tables S15 and S16); four of these were buried with distinguishable grave goods (discussed above and in fig. S1). 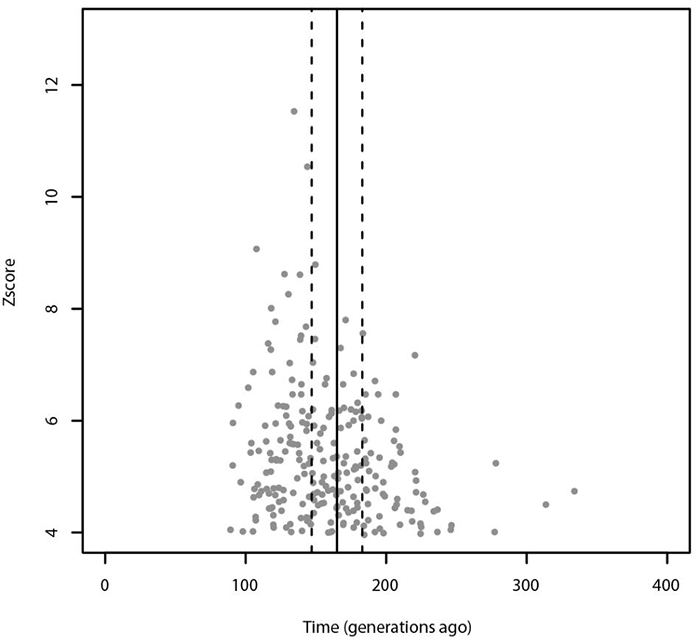 These data show that at Niederstotzingen, at least in death, diverse cultural affiliations could be appropriated even within the same family across just two generations. This finding is somewhat similar to the burial of the Frankish King Childeric in the 5th century CE with a combination of Frankish and Byzantine grave goods that symbolized both his provenance and military service to the Romans (4). 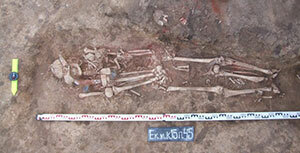 The burial of three unrelated individuals (3B, 3C, and 12C) in multiple graves beside the rest of the cohort would imply that this Alemannic group buried their dead based on a combination of familial ties and fellowship. One explanation could be that they were adopted as children from another region to be trained as warriors, which was a common practice at the time; these children were raised with equal regard in the familia (2, 4). 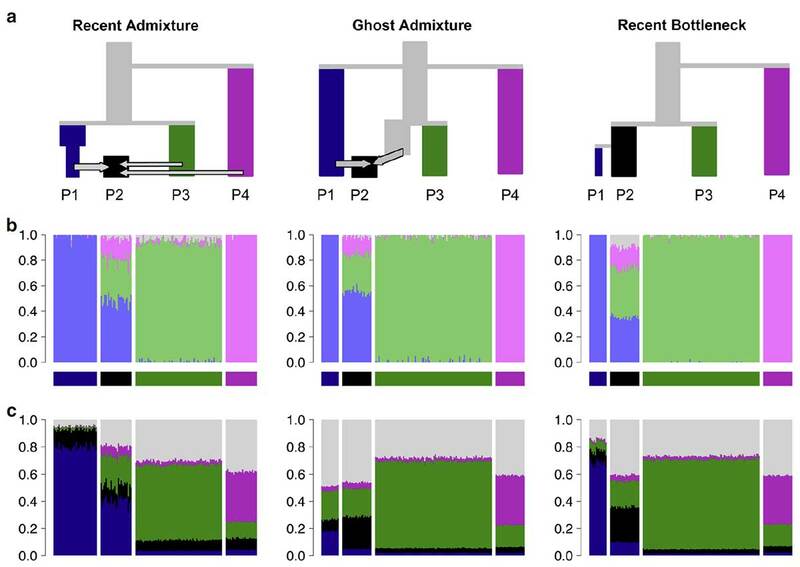 Reconstruction of first- and second-degree relatedness among all related individuals. Bold black lines and blue lines indicate first- and second-degree relatedness, respectively. 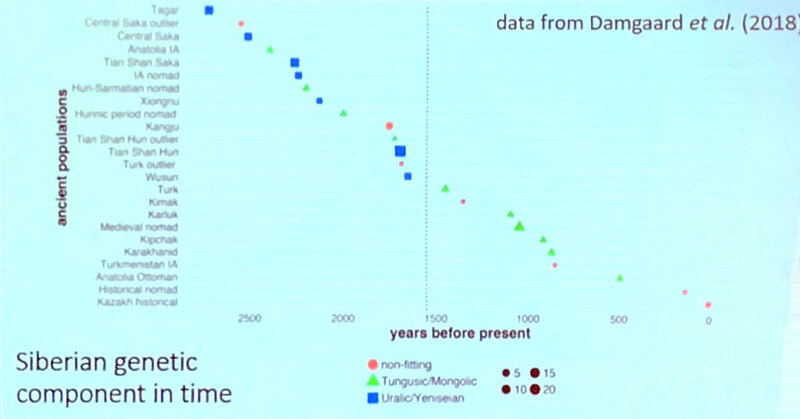 Dark blue squares are identified males with age-at-death estimates years old (y.o. 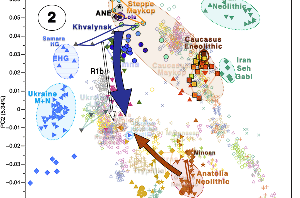 ), mtDNA haplotypes, and NRY haplogroups. Red circles represent unidentified females that passed maternal haplotypes to their offspring. The light square represents one male infant that shares its maternal haplotype with individuals 12B and 9. N.D., not determined. The 7th century CE burial in Niederstotzingen represents the best-preserved example of an Alemannic Adelsgrablege. The observation that burial of the remains was close to a Roman crossroads, orientated in a considered way, and associated with rich grave goods points to a noble gravesite of an Alemannic familia with external cultural influences. 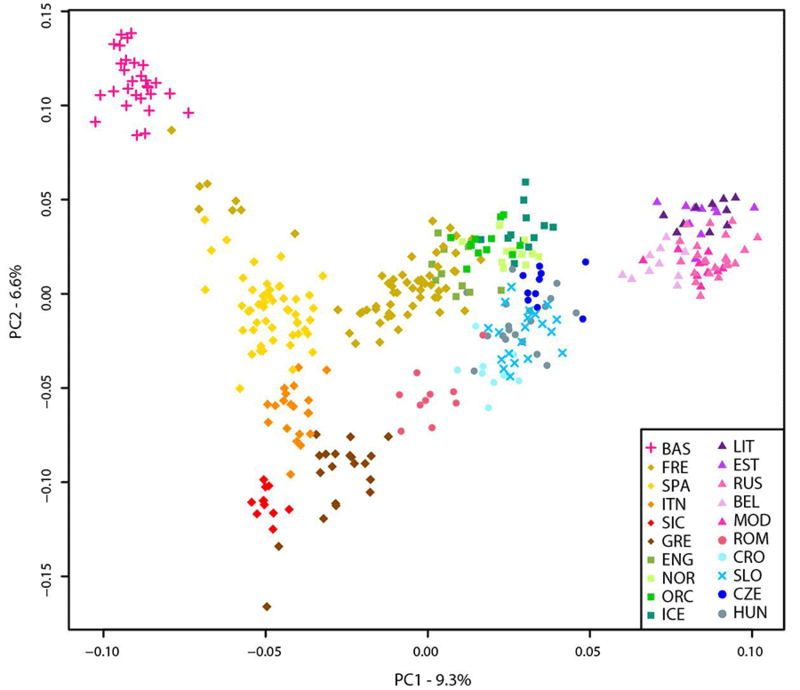 The high percentage of males in the burial site suggests that this site was intended for a ranked warrior group, meaning that the individuals are not representative of the population existing in 7th century CE Alemannia. The kinship estimates show that kinship structure was organized around the familia, which is defined by close association of related and unrelated individuals united for a common purpose. The apparent kinship structure is consistent with the hypothesized Personenverbandstaaten, which was a system by which Merovingian nobles enforced rule in the Duchies of Alemannia, Thuringia, Burgundy, and elsewhere. 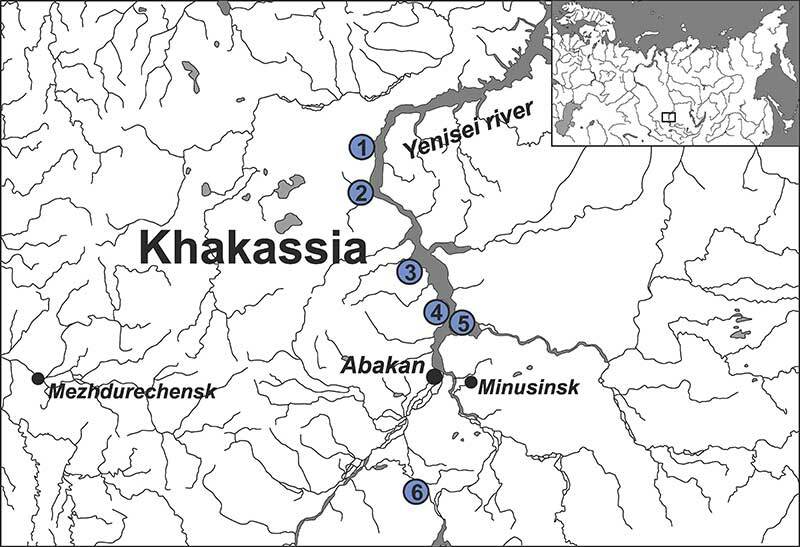 Beyond the origin of the grave goods, we show isotopic and genetic evidence for contact with communities external to the region and evidence for shared ancestry between northern and southern Europeans. 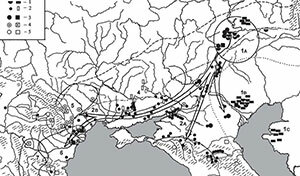 This finding invites debate on the Alemannic power system that may have been highly influenced by mobility and personal relations. 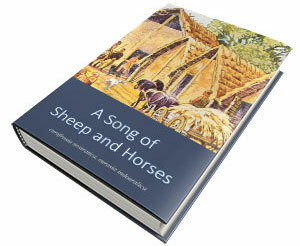 Texts and images distributed under the terms of the Creative Commons Attribution-NonCommercial license.